The planet Mars shares its orbit with a handful of small asteroids, the so-called Trojans. Among them, one finds a unique group, all moving in very similar orbits, suggesting that they originated from the same object. But the mechanism that produced this "family" has been a mystery. Now, an international team of astronomers believe they have identified the culprit: sunlight. Their findings, which highlight how small asteroids near the Sun may evolve, are to be presented at the annual Meeting of the Division of Planetary Sciences of the American Astronomical Society at Provo, Utah this week, by Dr. Apostolos Christou, a Research Astronomer at the Armagh Observatory and Planetarium in Northern Ireland, United Kingdom and leader of the research team. Trojan asteroids are trapped within gravitational "safe havens" 60 degrees in front of and behind the planet. The point leading the planet is L4; that trailing the planet is L5. Mars is the only terrestrial planet known to have Trojan companions in stable orbits. The first Mars Trojan, discovered over 25 years ago at L5, was named "Eureka" in reference to the famous exclamation by Ancient Greek mathematician Archimedes. The present tally is only ten, but even this relatively meagre sample shows interesting structure not seen elsewhere. For starters, all the Trojans, save one, are trailing Mars at its L5 Lagrange point. What's more, the orbits of all but one of the L5 Trojans form a tight group with 2-km sized Eureka its largest member and including objects as small as a few hundred meters. The team have been working to determine how the family came to be. For instance, collisions that occurred hundreds of millions of years ago formed similar families in the asteroid belt between Mars and Jupiter. But an impact origin does not quite fit with what we know about these Trojans. As Christou points out: "This family is incredibly compact. Only the gentlest of impacts, with the fragments barely able to escape Eureka's gravity, would work. Also, we know that the Yarkovsky effect, a tiny acceleration driven by absorbed and re-emitted sunlight on the asteroid, would cause family members to drift away over about a billion yr. What our models show, instead, is that even impacts with just enough energy to break up Eureka are so rare that they may not happen over the age of the solar system." Taking a step back, the team then adopted a different approach, looking at the Martian Trojans as a whole instead of focusing on the family. From this perspective, the lack of a family around the two remaining Mars Trojans, (101429) 1998 VF31 at L5 and (121514) 1999 UJ7 at L4 becomes an important clue to this puzzle. Christou explains: "These two asteroids are at the same distance from the Sun and of similar size to Eureka, yet we don't see asteroids grouping up near them. 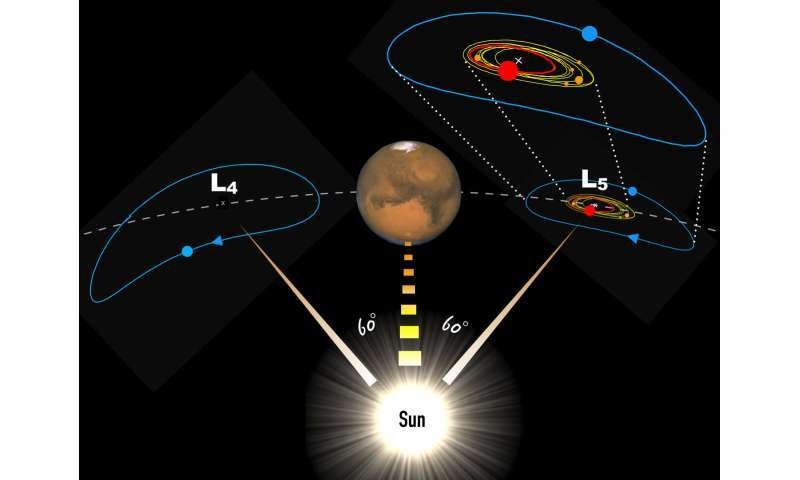 We believe this is telling us something about how families can or can't form at Mars' distance from the Sun." That "something" is very likely rotational fission, driven by the Yarkovsky-O'Keefe-Radzievskii-Paddack (YORP) effect - a sister effect to Yarkovsky, also driven by sunlight but changing the asteroid's rotation rather than the orbit. This is causing Eureka to spin up, eventually spawning off pieces of itself that escape to become independent asteroids orbiting the Sun. Interestingly, Eureka rotates once every two-and-a-half hours, about as fast as an asteroid can spin without coming apart; and recently the team observed the L4 asteroid, 1999 UJ7, finding that it spins 20 times slower, or once every 2 days. Other slow-spinning asteroids of this size are found to be in a "tumbling" state where - at least in theory - YORP may "switch off". UJ7 may, therefore, be simply incapable of producing new asteroids through fission. This explanation, however, does not work for 1998 VF31, the remaining Trojan at L5 which the team found to rotate once every 8 hr, not slow enough to prevent YORP from spinning it up to the point of fission. But since we don't see the new asteroids, something must be happening to them after they leave VF31. To find out what, Christou ran a computer simulation, following the orbits of virtual asteroids or clones produced by both VF31 and Eureka under the Yarkovsky effect. He discovered that, whereas Eureka "offspring" survive at L5 for more than a billion yr, VF31 is sitting next to a dynamical "escape hatch" allowing any bits breaking off it to escape within only 200 to 300 million years. So, akin to water draining out of an unplugged washbasin, objects separating from VF31 would escape quickly, leaving its vicinity clear of asteroids. The result: no family. Given the evidence in hand the fission hypothesis appears compelling, but Christou cautions that this is far from a closed-and-shut case; only time and more work will tell if the conclusion is correct. To test their theory, they plan to look for fainter Trojans, 100 metres across or less. "We don't currently see those, but a dedicated survey should detect them. Finding many small Trojans near Eureka, perhaps a few near VF31 but none at UJ7 would strongly indicate that we got it right." Ultimately, the work may have implications well beyond the solving of this little puzzle. Close to the Sun, YORP-induced fission - essentially the action of sunlight - may be as important for driving asteroid evolution as collisions. Indeed, Christou speculates that, if any stable Trojans of our own planet exit, YORP may turn them into a source of new near-Earth objects. "But that's another story", he concludes. Still listening for that faraway thunder rolling in across the vacuum of space from those invisible lightning bolts C_R keeps belaboring us with.